The cakes for all occasions. Especially liked by children, probably because of the chocolate stars sprinkled on the cake, which give the additional chocolate flavour. Rich in carbohydrates which are the main source of energy, contain the delicious cocoa powder. You will need: 1 egg 100 ml oil 150 ml water Directions for preparation: Put the cake mix in a bowl, add egg, oil and water. Mix it all with an electrical mixer (medium speed) for 3-4 minutes until you get smooth pastry. Put a smaller quantity of chocolate chips (about... show more You will need: 1 egg 100 ml oil 150 ml water Directions for preparation: Put the cake mix in a bowl, add egg, oil and water. Mix it all with an electrical mixer (medium speed) for 3-4 minutes until you get smooth pastry. Put a smaller quantity of chocolate chips (about 10 g) on the side, and mix in the rest of the quantity. In 12 paper cups that you have previously arranged on a baking plate, distribute the pastry evenly with a spoon so that the cups are filled by half. Sprinkle the remaining pieces of chocolate on the pastry surface. Bake for about 20 minutes in an oven heated to 200°C. Remove the baked muffins from the baking pan and let cool in their cups. 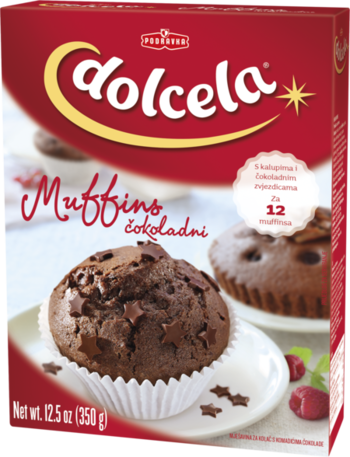 Ingredients muffin mix: wheat flour, sugar, cocoa powder (6%), raising agents (sodium hydrogen carbonate, disodium diphosphate), skimmed milk powder, emulsifier (E 481), salt, thickeners (E 466, xanthan gum), aroma. May contain eggs in trace amounts. Ingredients chocolate chips: sugar, cocoa mass, cocoa butter, emulsifier (E 442). Cocoa parts: 50% min. Storage: Keep in dry and cool place!